We can add a temporary (7 days maximum) UI element to Special:Block that invites people to the project page. We will want to translate this to our top languages to encourage a diverse group of participants. On Special:Block a [TBD UI element] should appear. It should be unintrusive and not interrupt usage of the block tool. The text displayed should be: There is a discussion about changing this blocking tool. See the designs, read why, and join the discussion here. TBolliger edited projects, added Anti-Harassment (AHT Sprint 23); removed Anti-Harassment (AHT Sprint 21/22). TBolliger moved this task from Ready to In progress on the Anti-Harassment (AHT Sprint 23) board. TBolliger edited projects, added Anti-Harassment (AHT Sprint 24); removed Anti-Harassment (AHT Sprint 23). TBolliger moved this task from Ready to In progress on the Anti-Harassment (AHT Sprint 24) board. TBolliger edited projects, added Anti-Harassment; removed Anti-Harassment (AHT Sprint 24). This needs to go on all Wikimedia wikis, so it will need to be translated and deployed. @alexhollender — Can you please help us decide on the UI element & look and feel for this? Even though this is temporary we still want it to be up to our standards of excellence. Thank you! TBolliger moved this task from Cards ready to be estimated to AHT Sprint 25 on the Anti-Harassment board. TBolliger edited projects, added Anti-Harassment (AHT Sprint 25); removed Anti-Harassment. @TBolliger maybe something like this? I've been thinking about this, and since the changes we are proposing would be changes to core (which effects everyone, not just Wikimedia), then I think we should add it to core (behind a config flag?) but remove it before the next version of MediaWiki is released. I like it! Do you think it needs some sort of "close" icon? We talked about this last week and agreed that the wording needs to be changed to lose the "we" to make it more reflective of the participatory design and research approach that we're using. @SPoore sounds good. Wondering how to phrase this? 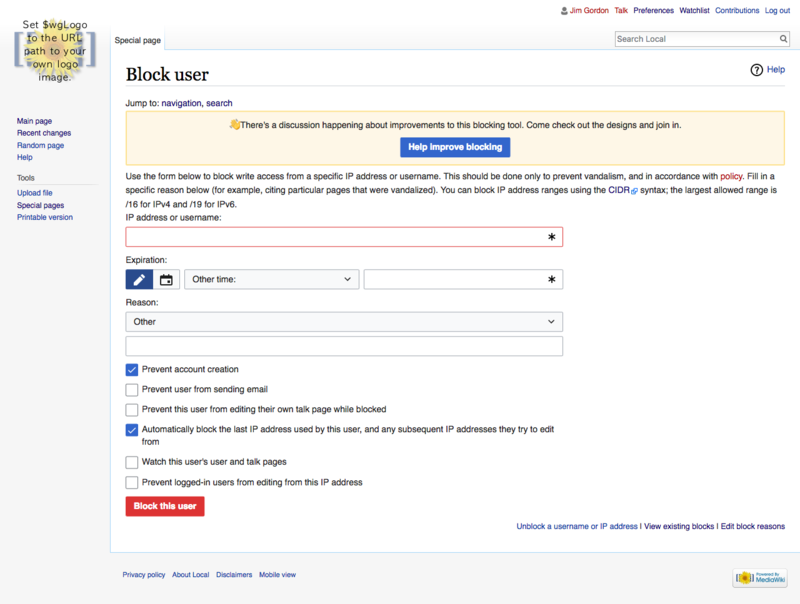 "There's a discussion happening about improvements to this blocking tool. Come check out the designs and join in"? Open to whatever you think makes sense. Do you think it needs some sort of "close" icon? @dbarratt What's your thinking here? I'm not sure it's necessary given that this will only be up for a week, however I'm not opposed to it. 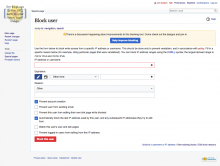 @alexhollender "There's a discussion happening about improvements to this blocking tool. Come check out the designs and join in" is perfect. There needs to be a link to discussion on meta at the end. 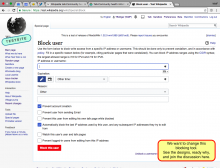 [mediawiki/core@master] Add a request for feedback on proposed changes to SpecialBlock. This is what I've got so far. @alexhollender, I eye-balled the spacing and used em's. Also, for some reason it looks like there is no space between the emoji and the text string in the screenshot, but it is there and looks fine on my computer. This is WMF specific so it shouldn't be in the core at all. I don't think it's WMF specific at all. The changes we are proposing will be made to core. However, if it shouldn't be in core, where should it be? 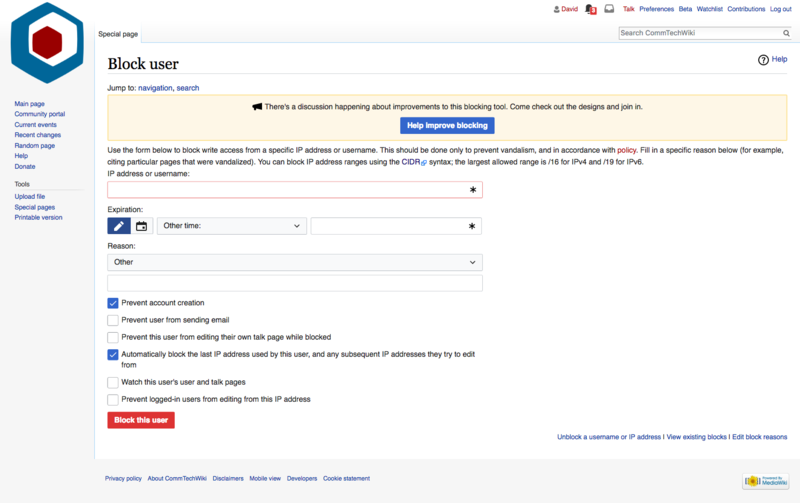 davidwbarratt:	MaxSem should I make a whole new extension for this? Unless someone disagrees, I'll move forward with moving this into WikimediaMessages. I also had an afterthought about doing this as a CentralNotice campaign. Yeah I looked into it, but it doesn't look like you can target a specific Special page. So it looks like WikimediaMessages it is, unless you have another suggestion? 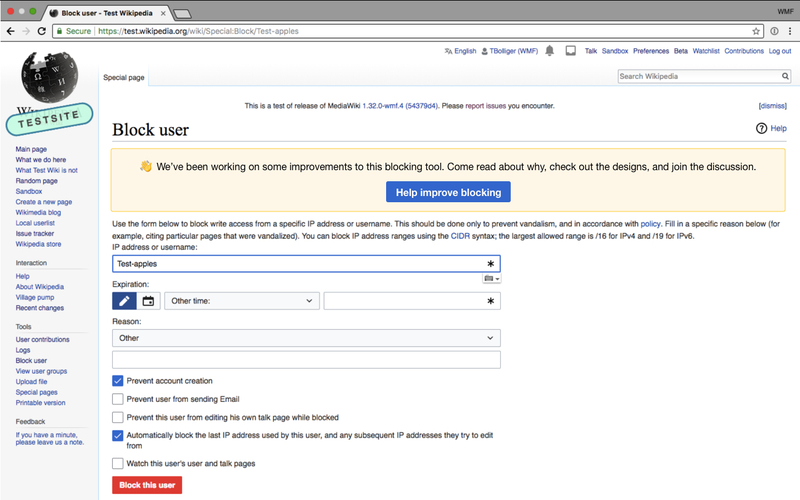 [mediawiki/extensions/WikimediaMessages@master] Add a request for feedback on proposed changes to SpecialBlock. Add a request for feedback on proposed changes to SpecialBlock. @MaxSem & @Mooeypoo I noticed that there is no way to get the pre text within an extension, so I created T199115 to fix that, and I used reflection within WikimediaMessages if that patch hasn't been committed yet. There's a test that tests it with and without the new method. This all looks good. Great job everyone! 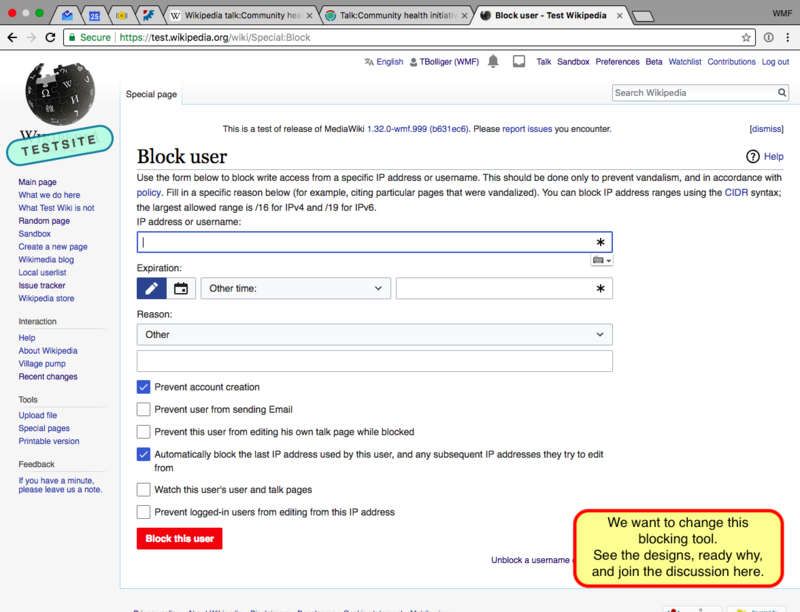 Let's try to get this tested, reviewed, deployed, and enabled on wikis as soon as possible — it blocks the rest of our work on the Partial Block project. Looks good! I gave it a test on my machine on Commtech wiki. @TBolliger & @SPoore This feature will start rolling out today and be global by Thursday, when would you like it to be enabled? (It can be enabled/disabled during any SWAT deploy starting now). This is already translated on 10+ languages. Let's enable on Thursday, July 19 and disable on Monday July 23. We can always enable it again later if need be after Wikimania.